a Reader's Diary post because a.) my copy is 622 pages long and b.) it took me almost two weeks to read. My impressions also kept changing as I read it and I like recording my thoughts as books of this length progress. I never quite know where I'll end up! The Woman in White was first published in book form in 1860, having originally appeared as a serial in 1959/60. The setting for the book are the years 1850/51 during the Great Exhibition in the Crystal Palace in England. The story is told through the narratives of several characters. The narratives are laid out as witnesses would be on a court case, presenting testimony as to a series of events all related to a woman in white, her relation to an English baronet, and an unfortunate marriage. Because it is a mystery and the plot unfolds slowly, I want to be careful not to offer any spoilers. The story is told, as I mentioned, through several narratives and from the perspective of key characters involved in a very peculiar set of circumstances, most of which would prove (unfortunately) laughable in today's modern age. Science would have solved several aspects of this mystery and as the modern reader follows the trail you want to offer them use of a lab at several points. I don't tell you that to turn you away from the story, but to tell you that you are going to have to put yourself in a reading mindset to enjoy a nicely weaved story, rather than a currently-scientifically-accurate one. But a nicely weaved story it is, at that! I absolutely loved the mystery of this book. The story begins with an introduction to one of the main characters, a Walter Hartright, who sets the stage for future romance and mystery. Right from the starting gate I was intrigued and always felt sad when I had to set the book down (to take care of other things in the house like, oh, say, laundry or something.) Although the story is long, Collins gives you just enough - and only enough - information through each character to make you have to keep on reading to find out how all the facts will ultimately tie-together. Sometimes I could guess at where he was going with certain facts and characters and sometimes I could not. I wanted the book to end and yet I didn't because it was so well told. In fact, I've had a very difficult time picking up another book since completing this one because it was so complex, challenging, (I'm running out of adjectives), entertaining and riveting. It's hard to find a follow-up that feels remotely worthy of the read! Wilkie Collins apparently had some legal training, which explains the format of the book. 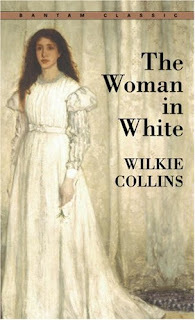 The Woman in White is considered one of the first official mystery books. The first impression of The Woman in White (1,000 copies) sold out on the first day. Within six months time the book was republished seven times, selling around 126,000 copies. The book was so popular that a line of merchandise was created to capitalize on the tale. Step aside Harry Potter! You could buy The Woman in White combs, perfume, bonnets and cloaks! It was made into a silent film in 1912. I have no idea how this would have worked. However, I imagine it was perfectly sensational at the time! In 1917 they made another silent film out of it. One begins to wonder . . . In 1929 there was another silent film made. I have no idea why. Both in 1982 and 1997, the BBC made a television series out of the book. I'm definitely more interested in seeing those on screen depictions rather than the silent films. In 2004, The Dark Clue: A Novel , by James Wilson was released which borrows characters from the original story and acts as a "sequel" of sorts. I don't think I'll read it. Collins wrote other mystery stories, such as No Name , Armadale , The Dead Secret and The Moonstone . I am definitely interested in reading more of his work. I can't believe I left The Woman in White sitting on my shelf for so long but I'm glad to have remedied that deplorable situation. Reading this was another reminder to me of how important and satisfying it is to read classics. I'm becoming even choosier in how I plan to close out my reading year. My library has The Moonstone and TWIW...on audio downloads and books. I really need to figure out how to do the downloads...if it took YOU 2 weeks to read, it'd take me 2 months! What Dickens have you tried that you didn't like? I'm thinking that since you enjoyed THe WOman in White, there might some Dickens novels that you would enjoy. I'm determined to make Dickens cool again everywhere I go. Sherry - LOL! Ok. You do that. I've tried Bleak House and A Tale of Two Cities. I didn't make it far into either, being bored to tears. I'm glad you tried "The Woman in White." I really enjoyed it both times I read it. I've also read "The Moonstone" and "Armadale." I enjoyed both of them also. I have several more of his books on my bookshelves but have not yet gotten around to reading them. Yet another book I've never read. It sounds like a fun book. I love a good mystery. When I saw Dickens I was surprised you read further. Ha! Very intriguing review. Even though I DO like Dickens, I had never heard of this author or any of his books. 622 pages is a little daunting, but I might look into it. I'd suggest Dickens' David Copperfield -- it's semi-autobiographical and just told straightforwardly. "The Woman in White" sounds like a good read. It's significance as the "first" mystery novel intrigues me. It's actually funny you mentioned that because I read one of Collins and Dickens plays (I can't for the life of me remember which one...something about a Swiss, winemaker? Maybe watchmaker? And it was all very swashbuckling and there was almost a murder in the Alps) and I didn't really like it. I ended up blaming Collins as a result, because I would allow no spot on Dickens's flawless reputation in my head. BUUUUT after your review I think I will give this one a shot. I mean, ruling out an author after reading a collaborative work isn't exactly fair anyway. P.S. I want a Woman in White bonnet. I really liked this one. Have you read The Moonstone yet? Oooh! You finished it! Yeah!!! I love The Woman in White when my book club read it several years back. Perhaps you should now add The Moonstone to your list to one day tackle. It's EXCELLENT too. Btw, SKIP the most recent adaptation of TWiW movie. It was AWFUL. Loved The Woman in White and am thinking I need a re-read soon. Check out the 1982 BBC TV version -- it's terrific! I'm going to make a plug here for No Name, my favorite (by a tiny margin) Collins book. In addition to having a typically well conceived plot, it contains, hands down, one of the top three Victorian female protagonists - and easily the most outrageous. In fact, the book turns the convention on its head. Magdalene Vanstone IS the significant character. Everyone else turns around her. As a bonus, the plot turns on a legal issue. (While now obsolete, it makes for a marvelous plot device.) Don't let this recommendation discourage you from reading Armadale or The Moonstone, both worthy books. I bought it today. It's on my summer list.